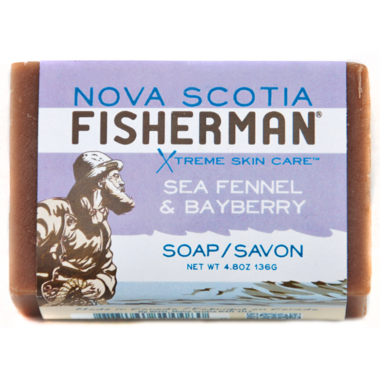 Nova Scotia Fisherman Sea Fennel & Bayberry Soap leaves your skin silky smooth with an amazing scent that casts a net over your senses. An above board bar that has all natural ingredients including Kelp. Love this soap. Smells great, lasts in the shower a long time, doesn't give me eczema. All good things. And they donate part of the proceeds to the Nature Conservancy. Love the scent. Love how my skin feels. The bar last a nice amount of time and does not get soggy or dried out. Nova Scotia Fisherman's soap are my every product for showering. I highly recommend it. Perfect for all skin types. I love the mint and clay one too and their other ones. I love the light scent of this soap. Very soothing.